Aug 6, 2003 - E. La Camera,1 and M. Carbone1. Dipartimento di .... Mailing address: Dipartimento di Patolo- .... aliquots of sample were used as templates. Dec 22, 2005 - Gulf and Red Sea. Testing of seafood, collected from ... a sterile grinder to achieve homogenated slurries. ... Cultures that proved to be motile were tested for haemolysin ... seasonal variations, total bacterial load, relationship. Oct 12, 1999 - Laboratory, Iowa State University, Ames, Iowa 500113; Center for ... Colorado 805214; and School of Veterinary Medicine, Tuskegee University, Tuskegee, Alabama .... PCR products were electrophoretically separated (120 V, 45 to 55 min). Oct 12, 2018 - Department of Microbiology, Faculty of Veterinary Medicine, Kafkas University, Kars, Turkey. * Correspondence: [email protected] 1. Copyright Â© 2001, American Society for Microbiology. ... Veterinary Food Inspection1 and Department of Pathology, Bacteriology and Poultry Diseases,2 Faculty. 27,103-1 18. 55 Youdirn, M. B. H. and Riederer, P. (1993) J. Neural. Transm. (Suppl.) 40,57-67. 56 Koller, W. C., Glatt, S., Vetere-Overfield, B. and. Hassanein, R.
Jul 20, 2016 - Greta GÃ¶lz1*, Thomas Alter1, Stefan Bereswill2, Markus M. ...... Golla SC, Murano EA, Johnson LG, Tipton NC, Cureington EA, Savell JW. Mar 25, 2002 - The family Campylobacteraceae includes the genera Arco- bacter and ..... 69:185â. 189. 17. Kepner, R. L., and J. R. Pratt. 1994. ... John. Wiley & Sons, New York, N.Y.. 31. Winters, D. K., A. E. O'Leary, and M. F. Slavik. 1998.
the neighbor-joining method (MEGA software, version 2.1). The distance matrix ... U03775 for Anaplasma bovis (formerly Ehrlichia bovis), AF283007 for Ana-. Sep 7, 2018 - The dilution of full ejaculates (total volumes between 1,500 ... of variance (ANOVA) was carried out using IBM SPSS Statistics 25 (SPSS,. Mar 24, 2015 - Quantitative PCR (qPCR) in the presence of SYBR Green I was ..... Expression analysis of IL6 by means of RT-qPCR. ..... 100x magnification. May 30, 1986 - Journal of Coastal Environment (JCE) is published by the Centre for .... The temperature of water at the surface varies from region to region within a range ... recorded at Cochin and Thiruvananthapuram. ...... AIDS and cancer. Apr 12, 2011 - Petersen, R.F., Harrington, C.S., Kortegaard, H.E. and On, S.L. (2007) A ... L., Wesley, I.V., Kiehlbauch, J.A., Larson, D.J., Thomas, L.A. and. Foods contaminated with injured cells of pathogenic bacterial strains are of potential health risk. Employing ... frozen food samples employing enrichment culture technique. Foods are very ..... bacteria. In: Bacteriological analytical manual, 8th. M. T. Fera,1* T. L. Maugeri,2 C. Gugliandolo,2 C. Beninati,1 M. Giannone,1. E. La Camera,1 and M. .... Seawater samples (3 liters) were collected by using prest-. APPLIED AND ENVIRONMENTAL MICROBIOLOGY, Mar. 2004, p. 1271–1276 0099-2240/04/$08.00⫹0 DOI: 10.1128/AEM.70.3.1271–1276.2004 Copyright © 2004, American Society for Microbiology. All Rights Reserved. Thailand (6), from river water in Italy (17), from groundwater sources (20), and from sewage (22). Since Arcobacter spp. have been isolated from water and mussels from a brackish lake near Messina, Italy (14), the present study was undertaken to analyze the presence of Arcobacter spp. in the coastal waters of the Straits of Messina and in plankton by using both classical methods and molecular techniques. The molecular methods were used to evaluate nonviable and viable but noncultivable forms (3, 4, 5, 18). The latter state is a sophisticated strategy developed by many gram-negative bacteria to survive under adverse environmental conditions. Conditions that have been shown to induce nonculturability differ according to the organism and include factors such as starvation, salinity, temperature, visible light, osmotic stress, and desiccation. The loss of culturability may not guarantee a loss of pathogenicity. Knowledge of the survival strategies of arcobacters in the environment is very important for control of both water quality and transmission of disease. The presence of Arcobacter isolates in food animals and water and their association with human and animal diseases mean that there must be reliable methods for correct identification of these organisms, as well as for monitoring the spread of Arcobacter isolates in different environments. Culture techniques are often time-consuming and give poor results for species that are difficult to culture, while DNA analysis based on nucleic acid amplification is very rapid and dependable. The presence of Arcobacter spp. in the marine environment of the Straits of Messina has special importance, since seawater is known to contain both autochthonous and allochthonous microorganisms, the latter coming from shore areas. APPL. ENVIRON. MICROBIOL. kit was added, and the sample was incubated at 70°C for 10 min. Next, 200 ␮l of ethanol was added. The mixture was then loaded onto the DNeasy minicolumn and centrifuged at 6,000 ⫻ g for 1 min. The Dneasy minicolumn was placed in a 2-ml collection microtube, and the tube containing the mixture was discarded. The column material was washed with 500 ␮l of the first washing buffer and with 500 ␮l of the second washing buffer provided in the kit. Finally, the DNA was eluted with 200 ␮l of a third buffer provided in the kit. PCR conditions. Arcobacter genomic DNA was amplified with a HotStarTaq Master MixKit (Qiagen) and a PCR Sprint thermal cycler (Hybaid, Ashford, United Kingdom). The reaction mixtures used for PCR contained (per 50 ␮l) 1⫻ PCR buffer (50 mM KCl, 10 mM Tris-HCl [pH 8.3], 1.5 mM MgCl2), each deoxynucleoside triphosphate at a concentration of 200 ␮M, each primer at a concentration of 0.25 ␮M, and 2.5 U of HotStarTaq DNA polymerase, and 5 ␮l aliquots of sample were used as templates. The temperature profile for the PCR was as follows: an initial step of 15 min at 95°C, followed by denaturation for 1 min at 94°C, annealing for 1 min at 50°C, and primer extension for 1 min at 72°C. After the 35th cycle, the extension step was prolonged for 10 min to complete synthesis of all strands, and then the samples were kept at 4°C until analysis. Negative and positive controls were included in every experiment. PCR products were detected by gel electrophoresis. Samples (5 ␮l) of final PCR products were loaded onto 1.5% agarose gels and subjected to electrophoresis in 1⫻ TAE buffer (0.04 M Tris-acetate, 0.001 M EDTA) for 60 to 90 min at 100 V. The gels were stained with ethidium bromide and photographed with UV light transillumination. A 100-bp DNA ladder (New England Biolabs) was included in each gel as a molecular size standard. Oligonucleotide primers. Three pairs of primers targeting the 16S and 23S genes were used in PCR assays for detection and identification of Arcobacter spp. These primers amplified a 257-bp fragment from A. cryaerophilus (ArcCRY), a 401-bp fragment from A. butzleri (ArcBUTZ), and a 641-bp fragment from A. skirrowii (ArcSKIR) (8). The sequences of the primers were as follows: ArcBUTZ Top, 5⬘-CCT GGA CTT GAC ATA GTA AGA ATG A-3⬘; Bot 16S-rDNA, 5⬘-CGT ATT CAC CGT AGC ATA GC-3⬘; ArcCRY Top, 5⬘-TGC TGG AGC GGA TAG AAG TA-3⬘; Bot 23S-rDNA, 5⬘-AAC AAC CTA CGT CCT TCG AC-3⬘; ArcSKIR Top, 5⬘-GGC GAT TTA CTG GAA CAC-A3⬘; and Bot 16S-rDNA, 5⬘-CGT ATT CAC CGT AGC ATA GC-3⬘. The primers were synthesized by GENSET SA (Paris, France). PCR sensitivity. In preliminary experiments we determined the analytical sensitivity of the PCR. To do this, DNA was extracted from serial dilutions of Arcobacter spp. broth cultures. Dilution series (100 to 10⫺9) were prepared by using a Dneasy tissue kit (Qiagen). In these dilution series the actual number of CFU was determined by culturing. The following strains were used: A. butzleri ATCC 49616, A. cryaerophilus ATCC 43157, and A. skirrowii ATCC 51132. The detection limits were approximately 5, 7, and 3 CFU for A. cryaerophilus, A. skirrowii, and A. butzleri, respectively. Sequence analysis. Ten randomly selected PCR products having different molecular weights obtained from environmental samples were purified with a JET quick PCR purification spin kit (Celbio s.r.l., Milan, Italy) used according to the manufacturer’s instructions, and these products were used for nucleotide sequencing. Both DNA strands were sequenced with a ThermoSequenase fluorescently labeled primer cycle sequencing kit (Amersham Pharmacia) by using an ALFexpress DNA sequencer (Amersham Pharmacia). A homology analysis was carried out at the BCM Search Launcher server (http://searchlauncher.bcm.tmc .edu/seq-util/seq-util.html) (21). Blast software (http://www.ncbi.nlm.nih.gov /blast/) was used to conduct homology searches of the GenBank database (1). Plankton analysis. Aliquots of samples were preserved in formaldehyde at a final concentration of 4%. After sedimentation in an Utermo ¨hl chamber, samples were analyzed by using both inverted and stereoscopic microscopes (Zeiss) to determine the number of individuals per cubic meter and broad taxonomic groups. ND, no arcobacters detected. CM, cultural method. samples by PCR analysis by using four different extraction methods, and the results were compared with the results obtained when the standard culture method was used. The direct boiling method (method A) and lysis-protease treatment (method B) yielded larger amounts of DNA from the samples than the other two methods (methods C and D) yielded. Methods A and B always enabled Arcobacter detection. Additional steps, including phenol-chloroform-isoamyl alcohol extraction and ethanol precipitation (methods C and D), resulted in a loss of sensitivity (data not shown). A comparison of the sequences of 10 randomly selected PCR products obtained from samples with known 16S rRNA and 23S rRNA gene sequences in the GenBank database showed that there was complete homology between our amplified products and A. butzleri, A. cryaerophilus, and A. skirrowii sequences (4, 4, and 2 sequences, respectively). The Arcobacter detection rate for PCR amplification was much better than the detection rate for the traditional culture method (77.8 versus 41.7% for A. butzleri; 55.5 versus 0% for A. cryaerophilus; and 8.3 versus 0% for A. skirrowii). CM ND, no arcobacters detected. CM, cultural method. FIG. 1. Species-specific identification of four strains of Arcobacter isolated from samples collected in April and May 2001 by PCR. The gel is an ethidium bromide-stained 1.5% agarose gel containing amplified products generated with primers ArcBUTZ, ArcCRY, and ArcSKIR. Lane 1, 100-bp ladder; lanes 2, 5, 8, and 11, PCR products obtained with A. butzleri-specific primers; lanes 3, 6, 9, and 12, PCR products obtained with A. cryaerophilus-specific primers; lanes 4, 7, 10, and 13, PCR products obtained with A. skirrowii-specific primers; lane 14, PCR product of A butzleri ATCC 49616 DNA amplified with A. butzleri-specific primers; lane 15, PCR product of A. cryaerophilus ATCC 43157 DNA amplified with A. cryaerophilus-specific primers; lane 16, PCR product of A. skirrowii ATCC 51132 DNA amplified with A. skirrowii-specific primers. Arcobacter spp. were found more frequently in seawater and in large-plankton samples than in small-plankton samples. No amplification was observed with DNA extracted from any of the environmental samples collected in August (Tables 1 and 2). Amplified products of A. butzleri were detected in seawater samples collected in all months except August. A. cryaerophilus was detected in all seawater samples except those collected in June, August, September, and October, while A. skirrowii was observed only in March. Figure 2 shows the amplified products obtained from the seawater sample collected in March 2002 when the four different DNA extraction methods were used. The PCR assays used to examine the occurrence of Arcobacter spp. associated with small plankton yielded specific products in May, June, July, November, December, January, February, and March. Only A. butzleri was detected in samples collected in May, June, November, and March. A. butzleri with A. cryaerophilus were observed in July, December, and January. Only A. cryaerophilus was detected in February. Figure 3 shows the amplified products of A. butzleri and A. cryaerophilus from the small-plankton sample collected in December 2001. No A. skirrowii PCR product was obtained from small plankton. The PCR assay with the large-plankton samples showed that A. butzleri, A. cryaerophilus, and A. skirrowii were present in the samples collected in September and February. A. butzleri and A. cryaerophilus were present in April, June, July, November, and December (Fig. 4). Only A. butzleri was detected in May, October, and March, and only A. cryaerophilus was detected in January. The level of large plankton varied greatly during the time studied and was higher during the period from July to September. Copepods accounted for 86.13% of all individuals. Phytoplankton was present in the small fraction, and it was mainly diatoms. FIG. 2. PCR products amplified from a single seawater sample obtained in March 2002 after different extraction methods were used. The gel is an ethidium bromide-stained 1.5% agarose gel containing amplified products generated with primers ArcBUTZ, ArcCRY, and ArcSKIR. Lane 1, 100-bp ladder; lanes 2 to 4, extraction method A; lanes 5 to 7, extraction method B; lanes 8 to 10, extraction method C; lanes 11 to 13, extraction method D; lanes 2, 5, 8, and 11, PCR products obtained with A. butzleri-specific primers; lanes 3, 6, 9, and 12, PCR products obtained with A. cryaerophilus-specific primers; lanes 4 and 7, PCR products obtained with A. skirrowii-specific primers; lanes 10 and 13, PCR products obtained with A. skirrowii-specific primers; lane 14, PCR product of A butzleri ATCC 49616 DNA amplified with A. butzleri-specific primers; lane 15, PCR product of A. cryaerophilus ATCC 43157 DNA amplified with A. cryaerophilus-specific primers; lane 16, PCR product of A. skirrowii ATCC 51132 DNA amplified with A. skirrowii-specific primers. FIG. 3. PCR products amplified from a single small-plankton sample obtained in December 2001 after different extraction methods were used. The gel is an ethidium bromide-stained 1.5% agarose gel containing amplified products generated with primers ArcBUTZ, ArcCRY, and ArcSKIR. Lane 1, 100-bp ladder; lanes 2 to 4, extraction method A; lanes 5 to 7, extraction method B; lanes 8 to 10, extraction method C; lanes 11 to 13, extraction method D; lanes 2, 5, and 8, PCR products obtained with A. butzleri-specific primers; lanes 3, 6, and 9, PCR products obtained with A. cryaerophilus-specific primers; lane 11, PCR products obtained with A. butzleri-specific primers; lane 12, PCR products obtained with A. cryaerophilus-specific primers; lanes 4, 7, 10, and 13, PCR products obtained with A. skirrowii-specific primers; lane 14, PCR product of A butzleri ATCC 49616 DNA amplified with A. butzleri-specific primers; lane 15, PCR product of A. cryaerophilus ATCC 43157 DNA amplified with A. cryaerophilus-specific primers; lane 16, PCR product of A. skirrowii ATCC 51132 DNA amplified with A. skirrowii-specific primers. FIG. 4. PCR products amplified from a single large-plankton sample obtained in December 2001 after different extraction methods were used. The gel is an ethidium bromide-stained 1.5% agarose gel containing amplified products generated with primers ArcBUTZ, ArcCRY, and ArcSKIR. Lane 1, 100-bp ladder; lanes 2 to 4, extraction method A; lanes 5 to 7, extraction method B; lanes 8 to 10, extraction method C; lanes 11 to 13, extraction method D; lanes 2, 5, 8, and 11, PCR products obtained with A. butzleri-specific primers; lanes 3, 6, 9, and 12, PCR products obtained with A. cryaerophilus-specific primers; lanes 4, 7, 10, and 13, PCR products obtained with A. skirrowii-specific primers; lane 14, PCR product of A butzleri ATCC 49616 DNA amplified with A. butzleri-specific primers; lane 15, PCR product of A. cryaerophilus ATCC 43157 DNA amplified with A. cryaerophilus-specific primers; lane 16, PCR product of A. skirrowii ATCC 51132 DNA amplified with A. skirrowii-specific primers. DNA-based techniques are more rapid and sensitive than traditional culture techniques for detecting Arcobacter species. PCR assays characterized at the species level isolates that were phenotypically identified only at the genus level and detected Arcobacter spp. in a nonculturable state, both free living in marine water and intimately associated with plankton. In this study, the boiling method (method A) and the lysis-protease method (method B) yielded the largest amounts of DNA from the samples, resulting in the highest sensitivity for PCR detection, even if the extracts contained a slightly larger amount of PCR inhibitors than the extracts obtained by the other two methods contained. Indeed, the loss of sample DNA with additional steps (methods C and D) was not compensated for by the removal of PCR inhibitors (data not shown). This is the first time that A. butzleri, A. cryaerophilus, and A. skirrowii, which are associated with disease in humans and animals, were detected in a coastal marine environment. Molecular methods investigated in this study have distinct advantages over traditional culture methods for detection of arcobacters in environmental samples. PCR offers the advantages of specificity, sensitivity, rapidity, and the capacity to detect small amounts of target nucleic acid in a sample. PCR and DNA extraction have the potential to provide reliable identification of both routine and ambiguous pathogens, as well as mixtures of pathogens. Such accurate information is critical for disease diagnosis and epidemiological studies for both research and essential applications. 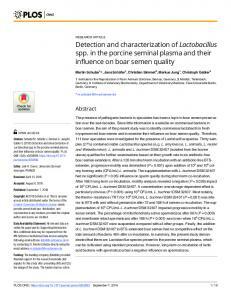 It is evident from this study that Arcobacter spp. are members of the bacterial flora of seawater and are associated with zooplankton in the coastal environment of Messina, Italy. ACKNOWLEDGMENTS This study was supported by research grants (2000 cofinancing MM06401917-006) from the Ministero dell’Universita` e della Ricerca Scientifica e Tecnologica (Rome, Italy). We thank Alessandro Andronico for photographic support. REFERENCES 1. Altschul, S. F., T. L. Madden, A. A. Schaffer, J. Zhang, Z. Zhang, W. Miller, and D. J. Lipman. 1997. Gapped BLAST and PSI-BLAST: a new generation of protein database search programs. Nucleic Acids Res. 25:3389–3402. 2. Anderson, K. F., J. A. Kiehlbauch, D. C. Anderson, H. M. McClure, and I. K. Wachsmuth. 1993. Arcobacter (Campylobacter) butzleri-associated diarrheal illness in a nonhuman primate population. Infect. Immun. 61:220–223. 3. Barer, M. R., L. T. Gribbon, C. R. Harwood, and C. E. Nwoguh. 1993. The viable but non-culturable hypothesis and medical bacteriology. Rev. Med. Microbiol. 4:183–191. 4. Barer, M. R., and C. R. Harwood. 1999. Bacterial viability and culturability. Adv. Microb. Physiol. 41:93–137. 5. Colwell, R. R., and H. Huq. 1994. Vibrios in the environment: viable but nonculturable Vibrio cholerae, p. 117–133. In I. K. Wachsmuth, P. A. Blake, and Ø. Olsvik (ed. ), Vibrio cholerae and cholera: molecular global perspectives. American Society for Microbiology, Washington, D.C. 6. Dhamabutra, N., P. Kamol-Rathanakul, and K. Pienthaweechai. 1992. Isolation of campylobacters from the canals of Bangkok metropolitan area. J. Med. Assoc. Thai. 75:350–364. 7. Ellis, W. A., S. D. Neill, J. J. O’Brien, H. W. Ferguson, and J. Hannan. 1977. Isolation of Spirillum/Vibrio-like organisms from bovine fetuses. Vet. Rec. 100:451–452. 8. Houf, K., A. Tutenel, L. De Zutter, J. Van Hoof, and P. Vandamme. 2000. Development of a multiplex PCR assay for the simultaneous detection and identification of Arcobacter butzleri, Arcobacter cryaerophilus and Arcobacter skirrowii. FEMS Microbiol. Lett. 193:89–94. 9. Hsueh, P. R., L. J. Teng, P. C. Yang, S. K. Wang, S. C. Chang, S. W. Ho, W. C. Hsieh, and K. T. Luh. 1997. Bacteremia caused by Arcobacter cryaerophilus 1B. J. Clin. Microbiol. 35:489–491. 10. Jacob, J., D. Woodward, I. Feuerpfeil, and W. M. Johnson. 1998. Isolation of Arcobacter butzleri in raw water and drinking water treatment plants in Germany. Zentralbl. Hyg. Umweltmed. 201:189–198. data base search and analysis services available on the World Wide Web. Genome Res. 6:454–462. Stampi, S., O. Varoli, F. Zanetti, and G. De Luca. 1993. Arcobacter cryaerophilus and thermophilic campylobacters in a sewage treatment plant in Italy: two secondary treatments compared. Epidemiol. Infect. 110:633– 639. Vandamme, P., E. Falsen, R. Rossau, B. Hoste, P. Segers, R. Tytgat, and J. De Ley. 1991. 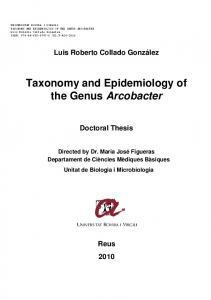 Revision of Campylobacter, Helicobacter, and Wolinella taxonomy: emendation of generic descriptions and proposal of Arcobacter gen. nov. Int. J. Syst. Bacteriol. 41:88–103. Vandamme, P., and H. Goossens. 1992. Taxonomy of Campylobacter, Arcobacter and Helicobacter: a review. Zentralbl. Bakteriol. 276:447–472. Vandamme, P., M. Vancanneyt, B. Pot, L. Mels, B. Hoste, D. Dewettinck, L. Vlaes, C. van Den Borre, R. Higgins, J. Hommez, K. Kersters, J. P. Butzler, and H. Goossens. 1992. Polyphasic taxonomic study of the emended genus Arcobacter with Arcobacter butzleri comb. nov. and Arcobacter skirrowii sp. nov., an aerotolerant bacterium isolated from veterinary specimens. Int. J. Syst. Bacteriol. 42:344–356. Wesley, I. V. 1997. 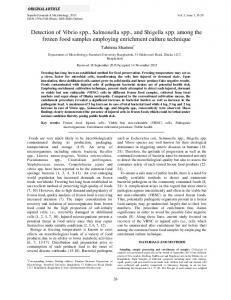 Helicobacter and Arcobacter: potential human foodborne pathogens? Trends Food Sci. Technol. 8:293–299. Wirsen, C. O., S. M. Sievert, C. M. Cavanaugh, S. J. Molyneaux, A. Ahmad, L. T. Taylor, E. F. DeLong, and C. D. Taylor. 2002. Characterization of an autotrophic sulfide-oxidizing marine Arcobacter sp. that produces filamentous sulfur. Appl. Environ. Microbiol. 68:316–325. Woo, P. C., K. T. Chong, K. Leung, T. Que, and K. Yuen. 2001. Identification of Arcobacter cryaerophilus isolated from a traffic accident victim with bacteremia by 16S ribosomal RNA gene sequencing. Diagn. Microbiol. Infect. Dis. 40:125–127. Yan, J. J., W. C. Ko, A. H. Huang, H. M. Chen, Y. T. Jin, and J. J. Wu. 2000. Arcobacter butzleri bacteremia in a patient with liver cirrhosis. J. Formos. Med. Assoc. 99:166–169. Report "Detection of Arcobacter spp. in the Coastal Environment of the"